In the era of simulation-based design, robust simulation tools are needed to efficiently analyze and accurately predict the performance of solids and structures for loadings and materials with large deformation response. Applications such as metal forming processes, kinematic response of soft biological tissues, earth moving and deep penetration in geotechnical/offshore engineering, and crashworthiness in the automotive industry are examples in which large deformations can become very important. In these applications, many of the materials from which bodies are made behave incompressible or nearly incompressible, that is, the volume of the body is preserved during the motion. Examples of these are elastomers, viscoelastic materials and some type of soils. 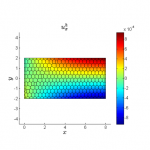 In addition, plastic deformations in elasto-plastic materials are also incompressible. Computational simulation in solid mechanics has been largely dominated by the finite element method. However, when conducting large deformation analysis of nearly incompressible materials with the finite element method two main shortcomings arise. First, the volume-preserving condition leads to a deleterious artificial stiffening of the system known as volumetric locking. Second, mesh distortions can become important breaking down the simulation very early with poor accuracy. A possible solution for the latter is to remesh the domain. However, remeshing is rather difficult in complex geometries and in addition leads to a very expensive mapping of history-dependent variables from the old mesh to the new one. To surmount remeshing difficulties, low-order (3-node triangular or 4-node tetrahedral) meshes can be very effective in a way: remeshing in complex geometries is not difficult with these type of meshes; however, the downside in using them in large deformation analysis of nearly incompressible solids is the poor performance they exhibit. 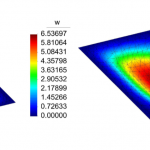 The main goal in this research project is the development and assessment of an efficient numerical method for simulation of nearly incompressible large deformation problems in solid mechanics. 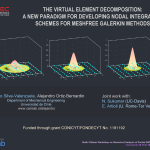 On using three key components, namely, meshfree basis functions, bubble functions and nodal integration schemes, a Lagrangian formulation will be proposed to rectify the poor performance of low-order (3-node triangular or 4-node tetrahedral) meshes in this type of nonlinear problems. Meshfree basis functions will be used to approximate displacement field variables allowing for larger mesh distortions than in the finite element method. 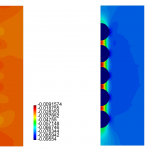 Bubble functions will allow to conceive a stable formulation for nearly incompressible solids. Finally, thanks to nodal integration schemes, history-dependent variables such as stresses and strains will become variables attached to the nodes leading to a particle-type method such as the smooth particle hydrodynamics (SPH). As a consequence of having a particle-type method, remeshing, if needed, will become a simple task. The numerical methodology will be assessed via various representative problems involving large deformations in solid mechanics such as hyperelastic and large strain elasto-plastic problems. 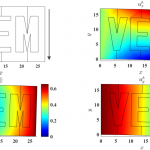 The outcome of this research will promote novel computational simulation tools to assist in better understanding nonlinear problems that are related to engineering and several areas of the industry. Ultimately, when problems are well understood it is possible to optimize and design better products.